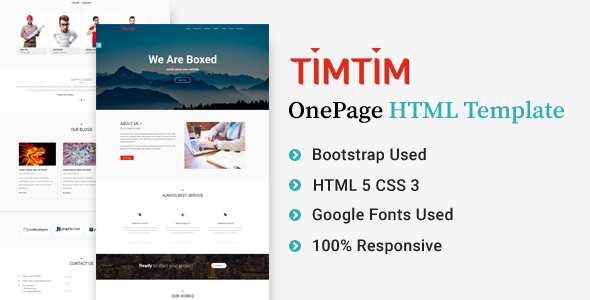 TIMTIM is a responsive, clean and modern designed HTML template. It is for corporate/business/portfolio websites, creative agencies and other businesses. It looks perfect on all major browsers, tablets and phones. Just take the best Template of your choice, change the text, add your images and done! IF YOU LIKE THIS WORK, DON’T FORGET TO RATE US 5 STAR AND GIVE YOUR FEEDBACK FOR BETTER UPDATE.